Can you imagine our festivals without paysam/kheer.! Payasam has become most wanted dessert in our special occasions. We have seen many types of traditional payasam. Why can’t we try something special if it serve to your special ones. I had a leftover pineapple in my kitchen and I was tired of juices. So I gave a shot to make payasam/kheer with it. Don’t worry! it is ‘tasted’ and officially approved by my family. This Pineapple Payasam is a typical traditional payasam only with a change of the main ingredients is the pineapple. It is a yummy payasam made with pineapple and sago/chowwary. An easy recipe with the essence flavours of pineapple and coconut. Pineapple payasam is a traditional south Indian kheer. Do try this easy and tasty pineapple payasam for any of your special occasions. Heat a pan and add 1 cup of water, sugar, pineapple and cook for 5 minutes. When the pineapple is cooked, slightly mash it with a spoon. Don’t make it to a paste. Cook the soaked chowwari (sago) in 2 cups of water. Add the cooked chowwari to the pineapple mixture. Add thin coconut milk to it and bring it to boil. Once it starts boiling, add the condensed milk(or sugar), thick coconut milk and heat it for 2 minutes. Don’t let it to boil. Add the cardamom powder to it and mix well, Turn off the flame. Heat 1 tsp of ghee in a pan and fry the cashew nuts. 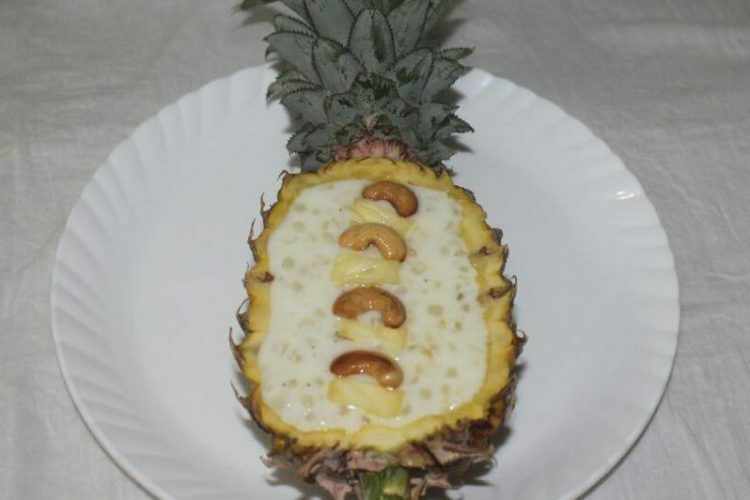 Garnish the payasam with roasted cashew nuts and pineapple pieces. Serve hot or cold.